Today sees the release of the eagerly awaited film ‘The Damned United’. For those outside the UK this is a film about the legendary football manager Brian Clough. ‘Cloughie’ was probably the best manager of all-time. He took two unfashionable Midlands teams (Derby and Forest) and made them the best in the land. He even guided Nottingham Forest to two European Cups after taking charge of them when they were in the Second Division. The film is based on the brilliant book ‘The Damned United’. I read the book last year and found it to be the most gripping Football book I have read. Even though it is difficult at times to know what is fact and what is fiction it chronicles the great achievements of ‘Old Big Head’(as Brian was affectionately known). I am looking forward to seeing the film, but just hope they don’t drift too far from the excellent book. So why am I going on about a film about a man who wore a tatty green goalkeeper’s top in my weekly SharePoint blog? The reason is my SharePoint message this week is ‘Don’t change it too much’. In the same way I hope the film stays true to the book I would encourage all SharePoint Projects Teams to try where ever possible to stick to ‘Out of the Box’ SharePoint (whether it is full MOSS or WSS). This might seem a bit boring and you might be surprised that somebody who works for a SharePoint Consultancy company is suggesting keeping it simple, but there are a few reasons. Firstly, if you stick to the basic ‘Out of the Box’ you know that you are following a path that many have successfully followed before. This means that if you do encounter problems you can quickly Google the problem and usually find hundreds of other people who have had the same problem. If disaster does strike restoring (or rebuilding) your sites will be so much easier if you haven’t made too many adaptations. Also the more changes you make the slower your SharePoint sites will load. We all know how annoying slow loading pages can be from life before broadband. The more you use SharePoint Designer and Visual Studio to enhance your pages the harder it will become for the everyday users to make changes. Some of you might not want the users making changes, but the beauty of SharePoint is that it can be personalised. IT are overworked enough without having to make every little change to the SharePoint system. Another advantage of Out of the Box SharePoint is it is a supported environment and ‘should’ also work whenever Microsoft supply Service Packs, or Hot Fixes. It is also easier to provide generic training for users. If you haven’t tried the short computer based training clips by CBTClips for SharePoint they are worth a look. Probably the most important advantage of ‘Out of the Box’ SharePoint is it saves you money. It saves on development and support costs. I suppose if the film was identical to the book this would also save money. Although, if it was exactly the same and you had already read the book would you even need to go and see the film. Even with ‘Out of the box’ SharePoint you can add your own flair. Changing theme, adding glossy pictures, moving webparts around, changing size of columns and adding some corporate branding can all make SharePoint more appealing. However, if you want to use all the features of SharePoint and a decent level of performance it will still look like SharePoint. I am reminded of an episode of ‘Fawlty Towers’ when an old lady moans about the view from her bedroom window. Basil says something like, ‘It’s a view of Torquay what else do you expect to see from a Torquay hotel window’. Although, I have said an advantage is saving money, it is important that the term ‘Out of the Box’ doesn’t just mean you run the install and that is it. Any successful SharePoint project still needs a good Project Team, involvement of a SharePoint Consultant/Specialist (perhaps I should mention Officetalk here), End User training and continual reviews. Just before you go radically changing it try and take a step back and ask your Project Team “What benefits will we get from these changes and what affect will they have on the performance of the system?” Now, it is time to go off and see the film ‘The Damned United’ and see how similar it really is to the book. Brian Clough was a legend and deserves a film about his life. In these days where we are all told we have to recycle I am going to talk about an under used part of SharePoint (both MOSS and WSS) that allows you to convert your old Excel spreadsheets into new super SharePoint lists. But first I am going to moan about refuge (sorry ‘recycling’) collections in the West Midlands. Friday in my road is bin day. Well, it used to be ‘bin day’ now it is called ‘two large wheelie bins (one green, one black), a green box and a large square bag day’. Yes, for any pedestrian on a Friday in our street it is an obstacle race similar to the Grand National especially for old Reg with his zimmer frame. Okay enough moaning I know we need to recycle to help save the planet and I am doing my bit for the planet (don’t forget you can still buy my Car Sharing SharePoint Template at Buy It Here). Oh, and I must have watched every episode ever of ‘The Wombles’. It just gets me annoyed when you hear that ninety-two year old Mrs. Batty has been sentenced to twenty years in jail for putting her old copy of ‘Woman’s Weekly’ in the wrong bin. Okay exaggeration she only really got fifteen years. Surely in this technical age somebody could invent a machine that can sort our waste out for us? Back to SharePoint then after that politically incorrect rant. Many organisations have got Excel spreadsheets that contain useful information, maybe going back years. You might have a list of all your Purchase Orders, a customer details list or a catalogue all stored on Excel spreadsheets. Now you are using SharePoint you don’t need to throw out these spreadsheets or even upload them into a Document Library. Instead you can import them straight into SharePoint. Why would you want them in SharePoint? By having the data from the spreadsheet in a SharePoint list it makes it easier to filter the data, display the data to the right audiences, search the data, add new records to the list and most importantly it is easier for people to have access to the data. So how do you import the spreadsheet into SharePoint? If the spreadsheet is in Excel (any version since 97 to the current 2007) it is a very quick and painless process. It is worth checking first that the Excel columns are vertical going from left to right with the column names in Row 1. Open up the SharePoint site where you want to create the new SharePoint list that will contain the data from your spreadsheet. Click ‘Site Actions’ – Create. 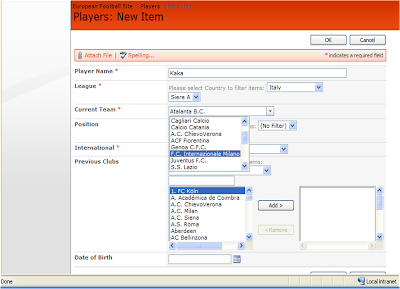 Then from the column ‘Custom List’ you will find ‘Import Spreadsheet’. Enter a ‘Name’ for the List and a ‘Description’, if you wish. Then in the ‘Import from Spreadsheet’ section browse to your spreadsheet. Oh, perhaps I should have mentioned earlier that you need to know where the spreadsheet is. Next click the ‘Import’ button. You will now get the ‘Import Windows SharePoint List’ screen as well as your Excel spreadsheet. This shows that it is working though WSS so you are not just restricted to MOSS. Cell A1 is highlighted but you can’t select all the cells until you change the dropdown ‘Range of Cells’ and then click in the bottom box ‘Select Range’. Now you can click on cell A1 hold the mouse button down and drag to the last cell in your spreadsheet so that all cells including the column titles are selected. Now click the ‘Import’ button and after a few seconds you will have a neatly presented SharePoint list with all the columns and data from your spreadsheet now displaying. You can add views and filters now to your heart’s content. Don’t forget to dispose of your excel file in the correct Recycling Bin after you have finished. SharePoint has many hidden gems like this and whilst I try and cover these in my blog I would always recommended attending a one day SharePoint Taster course with a company like Officetalk to really see what SharePoint can do. It might help you decide if you really need to invest in full MOSS or Windows SharePoint Services will do. Just hope my large recycling bag hasn’t blown away again after it has been emptied and that my empty wheelie bins aren’t blocking my drive when I get home.